This page contains a list of past events and campaigns. Click here to see our upcoming events and book your place! 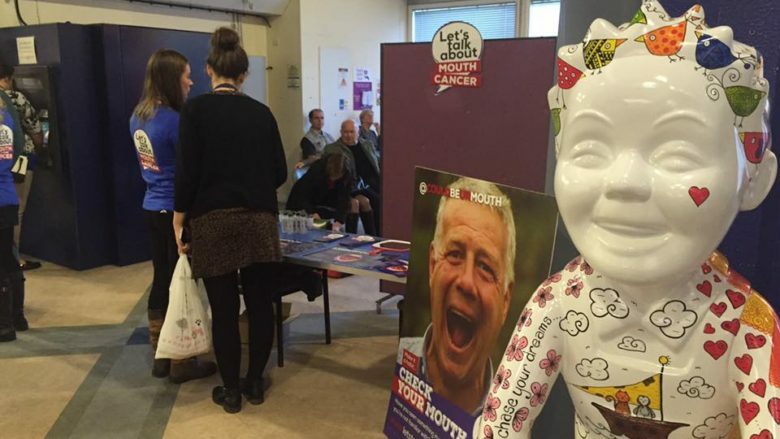 Mouth Cancer Action Week in the City of Dundee reached out and spread the word to a variety of at-risk communities. As in previous years Let’s Talk About Mouth Cancer (SC045100) teamed up with Dental students from the University of Dundee to reach out into the local area. The main campaign week 19th-23rd November was kicked off by two days of action with final year dental students. In the morning sessions interactive learning tutorials and lectures equipped the students with the knowledge and confidence in mouth cancer prevention, detection, diagnosis and patient empowerment. The importance of this was brought home by the story of Jeni Rankin, who sadly died within a year of her mouth cancer diagnosis, in a moving talk from her husband, Ian. risk groups with tailored messages about mouth cancer risk & detection. The groups reached this year were: ethnic minority women at the Dundee International Women’s Centre, care workers at multiple local residential elderly care homes and young people on the University Campus. With great enthusiasm the teams imparted the skills & knowledge to empower these target groups to identify common early signs & symptoms of mouth cancer in their own or their care home residents’ mouths. 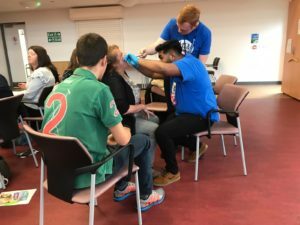 In addition, throughout Mouth Cancer Awareness Week, Dundee Dental Student’s Society held lunchtime stalls on the University campus to reach out to other young people who are one of the fastest growing groups to be affected by mouth cancer. Then they raised over £900 by a combination of raffles, bake sales and the ever-popular Acoustic Night. On Monday 4th June the team travelled to Aberdeen Dental School after an invitation from the Dean, Professor Richard Ibbetson. Fresh from passing their exams a group of 18 students from 4th year participated in our action day. A morning of mouth cancer teaching and campaign development was followed by an afternoon of campaigning across the Granite City. 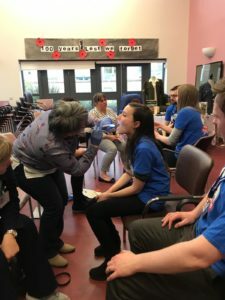 Our volunteers raised awareness and demonstrated mouth self-examination on the street, at a Shelter drop-in centre and the Aberdeen Health Village. We continued our Caring for Smiles programme as the students also visited 2 care homes, training the staff in mouth cancer signs & symptoms and the actions to take if encountered. A well-attended CPD evening followed where “Mouth Cancer: The Challenge” was set out to the assembled audience of dental professionals & students. We are grateful for Ian Rankin travelling up to share the story of his late wife Jeni and her journey through delayed diagnosis, treatment and fighting mouth cancer. Check out photos of the event on our Flickr page! Building on successful collaborations in the past 2 years we returned with our campaign to Dundee this November and aimed to reach further and wider into the community. After intensive tutorials and campaign design in the morning the teams of final year students & core trainees went to meet identified high risk groups: ethnic minority women at the Dundee International Women’s Centre, homeless people at an afternoon church drop-in session and care workers at local residential elderly care homes. 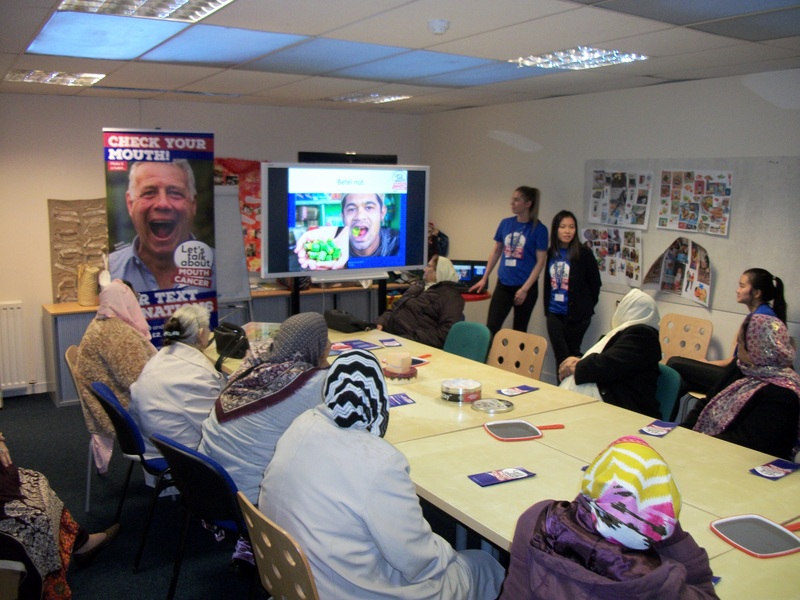 With great enthusiasm our volunteers imparted the skills & knowledge to empower these target groups to recognise common early signs & symptoms of mouth cancer in their own or their care home residents’ mouths. At the evening CPD lecture “What am I Looking At?” hosted by the BDA Dundee & Perth Section our trustees covered early detection and referral for mouth cancer. This was greatly emphasised by the live interview with Ian Rankin whose wife Jeni recently lost her fight against mouth cancer. On Thursday 16th November a small team travelled down to the Scottish Parliament where, joined by charity patron Scott Hastings, they lobbied and impressed upon MSPs the urgent challenge that mouth cancer presents and how simple risk reduction and early detection by mouth self-examination can save lives. Additionally, the pressure for gender-neutral HPV vaccination was further applied to parliamentarians. It was a busy yet successful month of campaigning; the support from all at Dundee Dental Hospital & School was greatly appreciated.